The British Virgin Islands have some fabulous beaches such as Jost Van Dyke. There are also spectacular natural wonders such as the The Baths of Virgin Gorda. However, with the development of the new cruise port park with its shops, restaurants and bars, many cruisers are beginning to spend time in Road Town itself and are looking for things to do in town. One such attraction is the Joseph Reynolds O'Neal Botanical Gardens National Park. It is located on the outskirts of Road Town and is within walking distance of the cruise port. Even for those who have little interest in botany, the Botanical Gardens is worth a visit because of its scenic vistas and cool shade. It is not a very large park and can be satisfactorily covered in an hour. 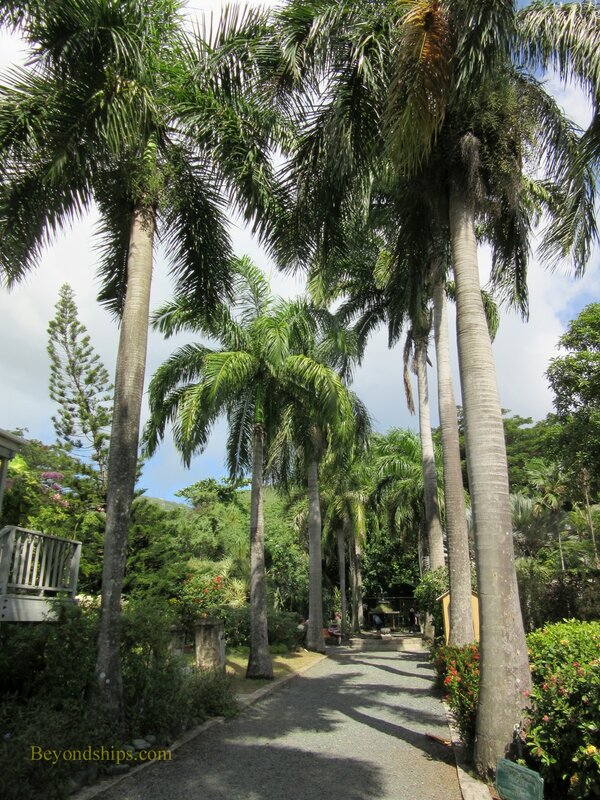 The Botanical Gardens opened in 1988 and was named in honor of Tortola's first conservationist. However, the site dates back to the 19th century when the British established an agricultural experiment station here to nurture and study indigenous and exotic plants. It is only four acres but it has been laid out so as to present some eye-pleasing scenes and to make the most of its various features. After entering the gate, the first feature that you see is a path flanked on either side by Royal Palms. At its intersection with another path there is a fountain, which creates a focal point. Visitors can relax on the four benches that surround the fountain. On the left-hand side of the path is Fishlock Hall. 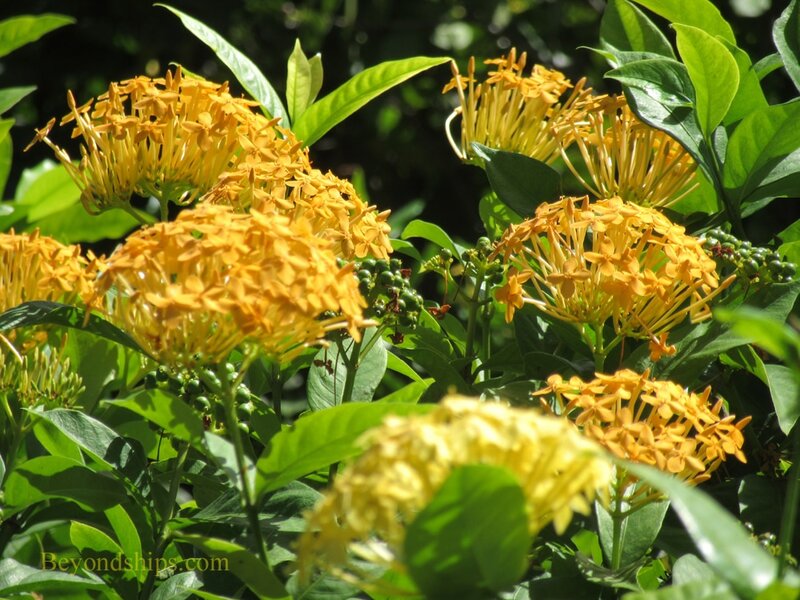 It is named after Walter Fishlock, a botanist who came to Tortola from London's Kew Gardens in the early years of the 20th century and discovered many previously unknown species. The building is a wooden tropical bungalow with a covered porch wrapping around two sides. Built on the ruins of the old agricultural station, it is now used by the park staff. There is not much to see inside the building but from the porch you get a good view of the Great Lawn on the other side of the path. The Great Lawn is surrounded by flowering plants designed to reflect all of the colors of the rainbow. Of course, which colors will be on display depends upon the time of the year. Designed by Margret Barwick, the wife of a former governor of the islands, the Great Lawn is reminiscent of a British park in its layout. Following the path suggested by the map that you get when you buy a ticket, you come to a number of more exotic vistas. There are areas shaded by different types of palms, cactus gardens, an orchid house, a fern houses and pergolas with various flowering vines. ​Perhaps the most popular feature is the Chinese Bridge, a wooden structure spanning a small pond. On one side, a dam keeps the pond from flooding the home of a pair of red tortises. On the other side, is a lily pond. Underneath the plants, the water is crowded with red and gold fish, who are easily visible from the bridge. Nearby is a small waterfall that cascades down a rock ledge into a pool. Look carefully and you might see a turtle swimming along. The waterfall is also near the Garden's Banyon tree. It is a sizable specimen with numerous shoots ascending skyward. Among other things, the Garden also has breadfruit, mangoes, bananas, and a bamboo collection. Consistent with the principles of British landscape architecture, the plants are arranged not in scientific rows but rather in natural looking settings. Thought has also been given to the composition of the scenes that unfold as one walks along the various paths. This makes for a variety of pleasing experiences. Although not on any organized shore excursion, on the day we visited the Botanical Gardens, there were a large number of British cruisers off of a P&O Cruises ship visiting the park as well as quite a few German cruisers off of an AIDA ship. There were also some North American cruisers from a Norwegian Cruise Line ship. Most had walked to the Gardens but a few had taken taxis. The Gardens is about a half hour walk from the cruise port. After leaving the cruise port shopping area turn left onto Administration Drive (the main road leading to the cruise port). Follow Administration Drive to the traffic light, cross the street and walk along Waterfront Drive. It is a busy road with shopping plazas on both sides of the street. Bear left at the traffic circle passing the gas station. Cross Fleming Street and walk a few feet down Fleming Street to Fishlock Road. Turn right here and walk the length of Fishlock Road. At the end of the road, you will see a two story building that is the British Virgin Island's Hourse of Assembly and Supreme Court. Turn right onto Main Street. The road makes a 90 degree turn to the left at a movie theater complex but continue on for another block until it intersects with Station Road. Turn left, the entrance to the Botanical Garden is about 20 yards down Station Road on the right side of the street.